Good results can be achieved through technology. The better the method, the more easily these results are obtained. GM Morando have developed their technology for years to achieve an easy to use product. The first and most important feature of the Giemme System technology is that it is made to measure. Every door will be made with precision to within a millimetre. We don’t have fixed heights or widths for each module so we can listen to your needs and make the product suitable for you. 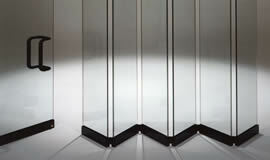 Giemme system is an all glass folding system. The profiles (measurements to the side) have been specifically designed to take up the most minimum room thus leaving maximum space for the glass. 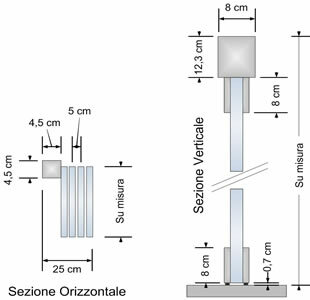 For doors lower than 2000 mm we provide a upper binary with reduced height: only 63 mm. The practical and light sliding system allows you to shut out the environment and gain a closed, sheltered space in only a moment. A particular characteristic of the Giemme system is that the panels aren’t single but united in groups of 3, 4 or more (depending upon requirements) and therefore it’s much quicker and easier to move them. The doors slide on the upper support rail with special Delrin® bearings that makes movement extremely lightweight (there are no wheels on the ground since the doors are hung from above). The full opening of the system and the minimum size of the folded panels creates an extremely flexible environment and helps you to realise the full potential of the space. The movement is completed with elegant, transparent glass handles. Thanks to the absence of mounts between the individual glass panes GIEMME SYSTEM gives brightness to the surrounding environment and allows the eye to see through the transparent wall without interruption. Between the doors and on the sides there is a seal made of transparent polycarbonate specially designed and patented by GM Morando. This H shaped seal fits perfectly between the glass panes shutting out the draughts and giving strength to the structure. The Giemme system is built with tried and tested materials all of which add to the quality and function. The supporting structure is made from anodized aluminium (20microns) or lacquered in polyester powder. All profiles are made from the primary alloy. The doors are made from 10 mm tempered glass. The polished edge slides on the rails with special nylon bearings. The screws and bolts are made of stainless steel which guarantees excellent quality and abolishes the need for maintenance. The Giemme system can be constructed to surround spaces of all kinds and sizes. There are no limits to the width.The only factor to consider is the weight: Giemme system is fully suspended. The structure is able to support about 30kg/mq. Normal masonry or wooden beams of medium size are able to support this weight. The maximum width of an individual panel is 750mm but it’s also possible to exceed this width providing that the height isn’t excessive. The parameter for the height is 3000mm. If it were necessary to cover heights greater than this, it could be made with a transom window (fixed or opening). GM FIT the “shaped” all-glass system is an exclusive design to solve the problems of sloping floors, a feature that’s occurs more frequently with outdoor spaces such as terraces or porches. These are possibilities for all straight, angled or curved products. Despite the fact that Giemme system is a product designed as a second closure and therefore doesn’t need to be certified like a window/door GM, Morando can demonstrate the quality of the product by obtaining the standard UNI EN 14351-1 (This rule regulates the performance of the window with regards to air tightness, water, wind and safety). From a thermal point of view, it has the maximum classification with regards to air permeability and the 10 mm tempered glass enables the place to be acclimatized all throughout the year. Customers who chose the Giemme System will testify to this. With or without the floor guide rail, Giemme system can be closed thanks to a system of bolts with pins that are fitted into the track above (fig. C), below in the floor guide (fig B), or in wells with a retractable spring recessed into the floor (in the absence of a floor guide)(fig. A). Thanks to the pivot pin in cases B and C the Giemme System can slide horizontally even with the bolts closed. 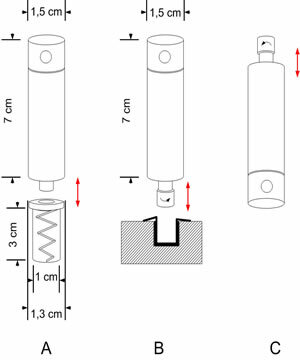 This fastening system is stable and ensures an excellent grip and allowed Giemme System to obtain the maximum safety classification for impact resistance (Regulations UNI EN 13451-1). If you opt for an access door, closure is guaranteed by the lock. The folding plate crystal glass Giemme System guarantees good sound insulation thanks to a combination of 10mm tempered glass and a polycarbonate system of seals between the individual panels. 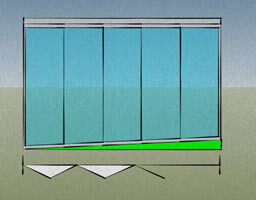 In fact the 10 mm tempered glass has a 33/35 db noise reduction capacity and the transparent “H” shaped seals between the individual panels create a unique “wall” which provides shelter from bad weather and external noise. This is great if we consider, for example, that a 10 cm wide panel has a sound absorbency of 41 db or if we compare it with a 20 cm thick wall whose sound absorbency is 48 db. Due to its insulating properties Giemme system is ideal used as a partition in private homes, offices or restaurants. Giemme system helps to save energy through “solar greenhouse” principle: the greenhouse captures the energy sent by the sun and stores it inside the building whilst at the same time reducing heat loss. A series of simulations has shown that for every closed solar greenhouse you can save 4-14% more energy with the Giemme System. With a suitable ventilation system this can peak to 20%. The solar greenhouse can be applied to both new and already established buildings by the closure of porches, balconies or arches. With a view to improving the energy quality of buildings, many local governments are adopting regulations and streamlining procedures to promote this type of work. GIEMME SYSTEM offers different solutions for the flooring guide each of which has specific characteristics. 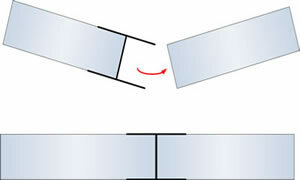 It’s possible to have the folding glass system even without a floor rail. GIEMME SYSTEM is a product designed for outdoor use and in fact it’s during the winter that it at its most impressive with its resistance to the elements.